Notes: Based on a novel by Miyazawa Kenji. The art style of this film is used in the semi-biographical telling of Miyazawa's life, "Spring and Chaos" (also reviewed on this site). With a long-absent father and an ailing mother, Giovanni is a kid who simply isn't allowed a childhood; not only must he work to keep food on the table, but he is mercilessly teased by schoolmates who simply don't understand his situation. All except for Campanella, son of his father's friend. On the night of the Festival of the Stars, Giovanni and Campanella both find themselves aboard the Galactic Railroad, a phantom train that takes them to places they never dreamed existed ... but the truth of this train is something that Giovanni could never be truly prepared for. I'd heard some good things about this movie, so I decided on a whim to spend one afternoon to watch this, and I sat down in Raph's dormitory to watch this thing on his VCR. That was one LONG afternoon. My fatal mistake was that I had double-featured this with Sugii Gisaburo's other major work of the 1980s, tha animated version of The Tale of Genji. I do believe I saw Raph's stuffed squirrel fall asleep in the background. Or was I hallucinating? 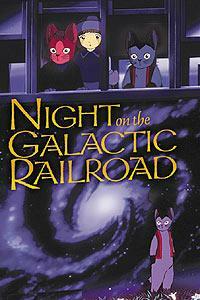 In any case, Night on the Galactic Railroad is a movie intended for children, as it is based on Kenji Miyazawa's sensitive tale about death, and how it should not be a frightening subject. However, I seriously don't think any child I know would have a attention span strong enough to gut his way through this one. With very little actual dialogue and rather dated art, this film really depends on the story to hold it along. While nowhere as epic as The Tale of Genji, this movie does have a good tale to tell, which, episodically, would be paced well, if only it were faster. The subject of death is foreshadowed pretty early in the movie, and though I caught on rather quickly to Campanella's ultimate fate, many viewers may not, as it is fairly subtle, and edges its way gently into your mind with numerous hints until you realize just what is going on. But in the meantime, the movie *feels* like a long train ride. Sometimes quiet, sometimes interesting, and sometimes you want to pull out your Game Boy until the next landmark comes along. The resolution is handled tastefully, gently, and kindly ... but it comes about an hour too late for most of the intended audience. The idea of subtlety seems to be lost on today's children, who are used to Disney epics and zany cartoons, and leads less to revelation than a good, long nap. Which is a pity, because there is a very good lesson to be learned from this movie, and if you really do pay good attention, you too may be wiping tears from your eyes at the end as I was. But the plodding pace the director has given this movie and the rather hallucinogenic quality of the art and music really prevent this from becoming the classic it ought to be...but rather more of an artsy curiosity. And after seeing this and The Tale of Genji, I am now truly surprised to see this is the same director who came up with the Street Fighter II movie. Recommended Audience: Nothing objectionable to speak of. At the same token, children would probably nod off or walk away after the first hour or so, which is a pity, because this story really is for them.